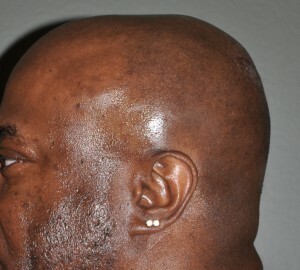 One of the most common aesthetic deformities of the entire skull is the flat back of the head. Well known to occur from sleeping positions in infants and predisposed to occur in certain ethnic groups, lack of a nice shape to the back of the head can be aesthetically disturbing. 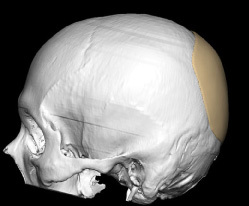 It occurs in a wide variety of presentations that differ in location (mid-occipital and crown flatness), plagiocephalic (one-sided) vs brachycephalic (both sides) and extent of missing occipital projection. 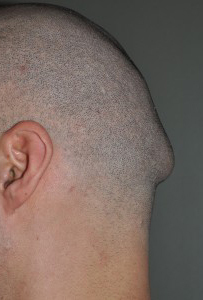 While the occurrence of these occipital shape disturbances occur in both women and men, there are some unique gender differences. Women tend to be highly focused on the lack of projection in the crown area which is really the junction of the top of the back of the head whose upper extent goes onto the top of the skull. 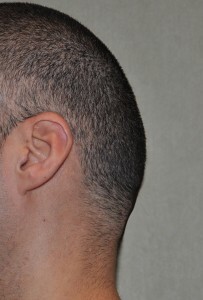 A male’s concern is often lack of mid-occipital projection or asymmetry of the two sides of the back of the head. 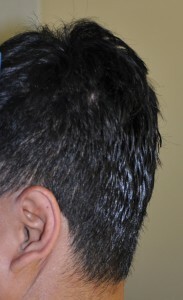 Both types of gender occipital deformities often involve elaborate and time consuming methods of hair camouflage on the part of the patient. Occipital augmentation can be done using intraoperatively applied bone cements (usually PMMA) or with the fabrication of custom implants. 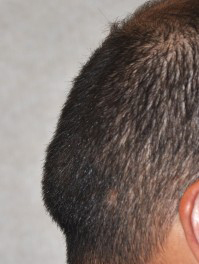 While long scalp incisions make the use of either augmentation material much easier, they are understandably not aesthetically acceptable for most patients. 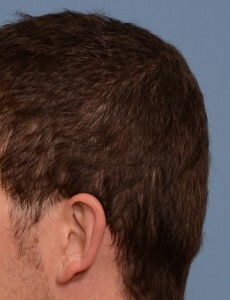 The use of smaller incisions and the unique requirements of intraoperative positioning can make occipital augmentation surgery challenging. PMMA can be applied through incision lengths of 5cm to 8cms depending on the size of the defect and the volume of material needed. This requires external manipulation and shaping of the material as it sets with great attention paid to creating smooth edge transitions. 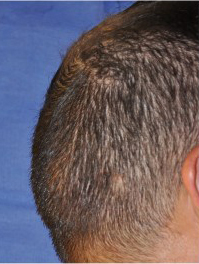 The incision can be placed high near the crown or low at the bottom of the hairline depending upon the location of the occipital augmentation needed and the patient’s hair density and pattern. Preoperative shaping of an occipital implant through a custom 3D design process makes any larger occipital deficiency more assured with a lower risk of potential revision. Even a large custom occipital implant, because it is made of solid silicone and has some flexibility, permits it to be inserted through a much smaller incision than one would envision possible. Excessive projection or bulging of the back of the head can be partially or completely corrected by a bone burring reduction of the outer cortex of the occipital skull bone. The amount of reduction will be limited to the thickness of the outer cortex which can be determined by measurements on a plain lateral skull x-ray or using axial 2D CT images. 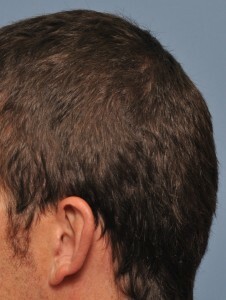 Occipital reduction is done through a horizontal scalp incision usually located directly over the most projecting area or lower down at the nuchal ridges at the bottom of the hairline. 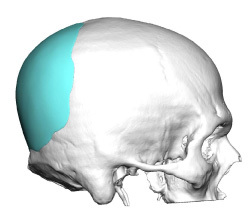 The occipital knob is a central projection of bony overgrowth on the lower end of the occipital bone. It is a very distinct and usually round bone thickness that produces a prominent bump or knob at the midline of the nuchal ridges. 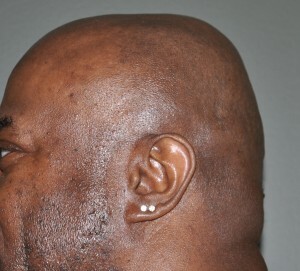 In some patients its size can be quite striking and really sticks out in the male who shaves his head or has very closely cropped hair. It can be completely reduced by a rotary burring of the excess bone through a very small horizontal scalp incision directly over it. The nuchal ridges of the occipital run along the bottom of the bone and serve as attachments for some of the neck’s soft tissues. (Fascia and muscle) Because they are muscular attachments the bony thickness of the nuchal ridge can become quite prominent and can appear as very distinct horizontal ridges that aesthetically mar an otherwise smooth back of the head contour. The nuchal ridges can be flattened by burring done their prominences to a smoother contour that blends better into the bone around them.